While we are only a small parish in Western New York, we are part of the broader Russian Orthodox Church, the largest Orthodox body in the world. We are also part of the global Eastern Orthodox Church which includes national churches in traditionally Orthodox countries like Russia, Greece, Romania, Serbia, Cyprus, and the Middle East, but has also spread throughout all the world. There are over 250 million Eastern Orthodox Christians in the world today and over 1 million in the United States. While many of our congregants were brought up in the Orthodox Church, many have journeyed to Orthodoxy either from other Christian faith traditions or from non-Christian spiritual traditions. Whether you are “on a journey” or just want to visit a local Orthodox church, you will be welcome at Sts Theodore. We are always happy to have others join us for prayer to and worship of the One God, the Father, the Son and the Holy Spirit. We hope you will find our site informative and edifying. We invite you to join us for one of our liturgical services which preserve the worshipping tradition of apostolic Christianity and grant those who participate in them an experience of heaven on earth. 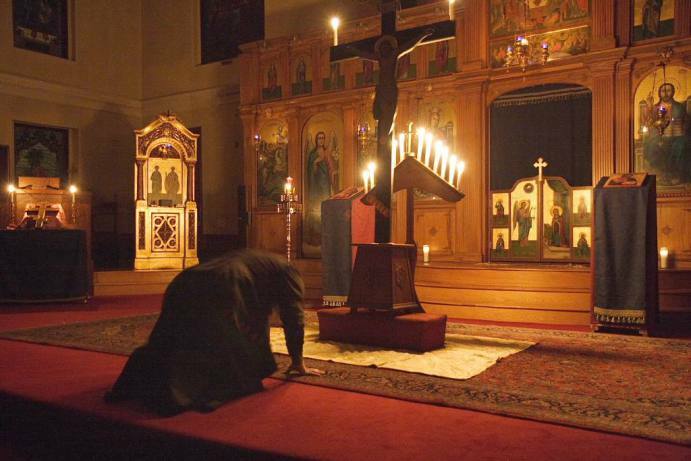 We have an All-Night Vigil service every Saturday at 5:00 p.m. and Divine Liturgy every Sunday morning beginning at 9:00 a.m. Lunch is served after Liturgy and all are welcome. We looking forward to meeting you. May the Lord bless you. Fr. John will be keeping open Office Hours if you need to meet with him. He will typically be available on Wednesday evenings after the Catechism class following the Weekly Akathist service and on Saturday afternoons from 2:00-4:00 pm before the time for Confessions. If you wish to speak to Fr. John about something in particular, please contact him ahead of time to make an appointment. We are nearing the end of Great Lent and drawing near to the Great and Holy Week of our Lord's Passion and Resurrection. Please view the Church calendar and the Schedule linked here for service times during Great and Holy Week and the Bright Week of Pascha: click here. Great Lent has begun! Please see the Calendar page for up-to-date service schedule. You can also download a copy of the complete schedule of upcoming services and events (click here). To help you with your Lenten struggles, listen to these recent sermons from the preparatory weeks preceding Great Lent on the three-fold cord of salvation: prayer, fasting and almsgiving. That's right! Saints Theodore now has its own YouTube channel (click here). You can listen to lectures from our Sts. Peter and Febronia Marriage and Family Life Retreat, check out classes that have been offered at the parish, or catch up on a sermon you might have missed. More content is being added all the time, so make sure you subscribe to get email reminders when new videos are added.